The recent bitcoin craze—and the substandard signature policies involved—bring signature enforceability to the forefront. If you’ve been keeping track of the wildly inflating (but adjusting everyday) bitcoin marketplace, you may know some detail about where they are trading and the crazy price. Perhaps you have read stories of what people are doing to get a piece of the action. However, what you may not know is that legal experts are concerned that the signatures used during bitcoin transactions may not hold up in court based on compliance issues. 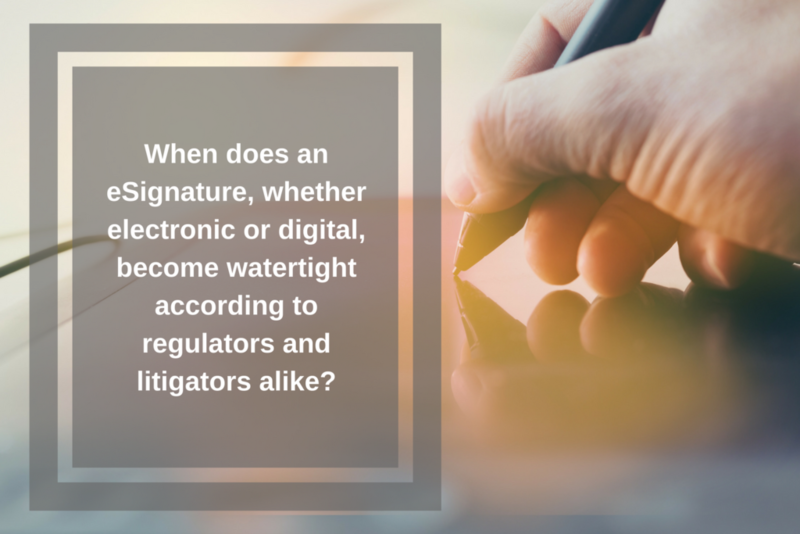 Which brings us to the perennial question: When does an eSignature, whether electronic or digital, become watertight according to regulators and litigators alike? As we’ve previously outlined, U.S. legislation (ESIGN/UETA) defines an electronic signature as an electronic sound, symbol, or process, attached to or logically associated with a contract or other record and executed or adopted by a person with the intent to sign the record. One of the most commonly used electronic signatures today is the Text Typed signature; meaning that one has used a keyboard to type their name, with the intent to sign “something”. Although Text Typed is the most common, electronic signatures are not limited to this method. Businesses seek critical documents electronically signed using other accepted methods such as voice, mouse, signature pads, iPad/iPhone (with your finger or stylus), Smartphones and more. What is important to note: an electronic signature can be applied by almost any means, but it is just the first step in a fully secure and compliant electronic signature process. Regardless, users will want to ensure they have a digital transaction management (DTM) process that binds the signature, regardless to file type, to the agreement. According to the bitcoin article, the problem with their SigWit signature protocol is that it creates separate data trees that may be discarded or placed separately from the rest of the transactional record. Among other legal risks, this is also a potential issue with simplified “click-through” eSignature processes. With the right eSignature technology, the legal integrity, admissibility and enforceability of your important documents is taken care of for you. We recommend utilizing a combination of electronic and digital applications, so that once the signature has been captured and applied to the document, it is then bound to it with a second digital signature. Besides gaining efficiencies by removing paper, the properly constructed digital process is arguably much safer than relying on paper systems that are subject to human error. In the long run, you will have assurance of the enforceability of your contracts via watertight signature processes.